The Isabella Stewart Gardner Museum has a thriving partnership with Bunker Hill Community College, established in 2016. In that spirit, the museum has built a thriving partnership with Bunker Hill Community College, offering free admission to its students, faculty, and staff and jointly organizing field trips. “We really want them to feel that this museum is theirs,” said Corine Zimmermann, the museum’s director of interpretation. The museum established the partnership in 2016.Michelle Grohe, the museum’s curator of education, said the museum staff felt community colleges were often overlooked by cultural institutions and saw value in the diversity of its students, who come from a wide range of backgrounds. The museum also has had a relationship with the Boston Public Schools, and wanted to build on its success. “We wanted to keep offering opportunities to students. It’s really important to make connections with everyone in Boston,” Grohe said. One way they do that is through field trips. The Bunker Hill professors plan with museum staff, pinpointing educational goals for the museum teachers to address. 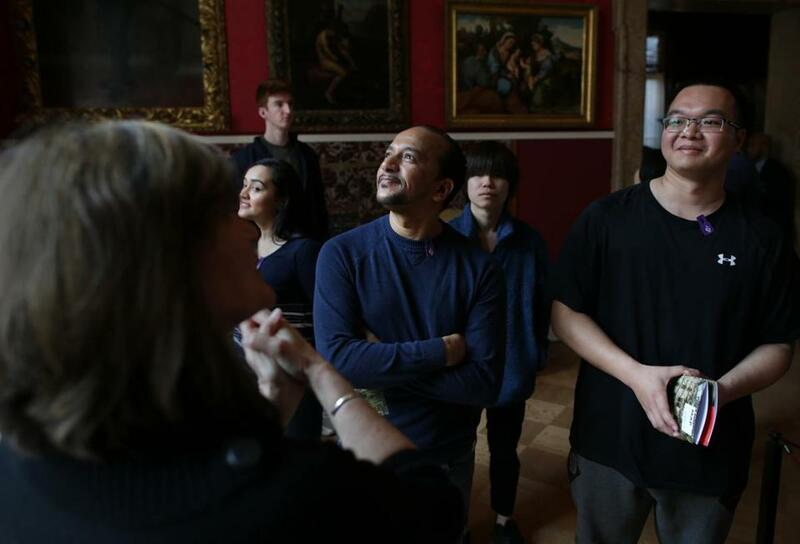 The museum teachers then teach the material by posing questions about the artwork using an approach called “visual thinking strategies,” which focuses on critical thinking. For example, a museum teacher might ask a business class to envision which of the Dutch painters featured in a gallery they’d want to collaborate with on a start-up, and what evidence drew them to that conclusion. Bunker Hill professor Ashley Paul, who co-teaches a mixed English Second Language class with Lindsay Naggie, visits the Gardner with her class at least once a semester. “We’re working on a literary analysis essay and the skills they use to analyze artwork transfer directly to analyzing literature,” Paul said. For Paul’s students, the visual thinking approach can be a helpful method to develop analysis skills while practicing English. Donna Hayne, the museum educator leading Paul’s class, said Bunker Hill field trips are always her favorite. “I always find the Bunker Hill students much more engaged and enthusiastic,” Hayne said.